Barcelona are victims of their own success. 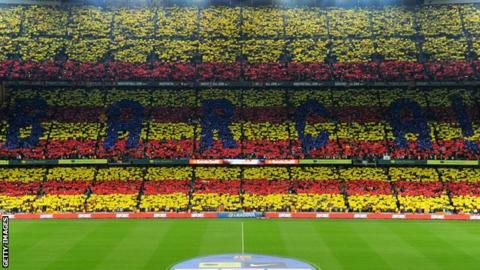 The Catalan club have become established as the prime example of the way certain values could be retained, even in the pursuit of sporting excellence. From the community links of its members who own the club, through the political influence of its Catalan identity, to the faith in a youth development programme that has delivered some of this generation's finest footballers, Barcelona became associated with their ideals. They are the most high-profile club in world football, and continue to proclaim the work of their La Masia academy. Fifa are investigating other teams that they believe signed youth players in direct contravention of Article 19 of the governing body's regulations, which was drawn up to address the trafficking of vulnerable young footballers, but the censure of Barcelona is symbolic. No club can consider itself beyond reach if the leading side, with all its associated self-esteem, was punished. There are specifics to the Barcelona case, and the club has already published a 14-point response to the 14-month transfer ban Fifa imposed. That includes the assertion that staff at La Masia always prioritise the duty of care they have to their young players; that the club develops people first, and footballers second. Barcelona are likely to appeal, although there seems no challenge to the fact rules were breached, merely that those rules are unnecessarily prohibitive. It will rankle in Barcelona, for instance, that a number of their young players are regularly signed by English Premier League clubs between the ages of 16 and 18, when they are free to move within the EU. Regulating the transfer market will always pose challenges when money, power and ambition are the driving forces to be reined in. The case, though, further highlights the disparity between the elite clubs and the European sides they are becoming increasingly detached from. Talent drain has become a significant issue for countries outside Europe's top five football nations - England, Spain, Germany, Italy and France. A second tier already exists. Clubs that once competed to win the European Cup, such as Ajax, Anderlecht, Benfica and Celtic, struggle to challenge beyond the group stages of the Champions League. Money has separated Barcelona, Real Madrid, Chelsea, Manchester City, Arsenal, Manchester United, Bayern Munich, Juventus and Paris St Germain from the rest, but also their leagues. Days before their punishment, Barcelona revealed they had signed the 17-year-old Croatian Alen Halilovic, one of the continent's most sought-after young players. Before money reshaped the landscape of European football, a player like Halilovic would have spent more time in Croatia, developing personally and contributing to the fortunes of Dinamo Zagreb. Belgium are enjoying the talents of a golden generation, yet goalkeeper Thibaut Courtois left Genk at 18 to sign for Chelsea, Vincent Kompany left Anderlecht at 18 for Hamburg, Eden Hazard joined Lille as youth player, and Romelu Lukaku left Anderlecht for Chelsea at 18. Preternaturally talented players will always represent an exception, but it is now standard practice for the top five leagues in Europe to stockpile the best young talent. The disparity between the leading five leagues, and the leading clubs within them, is symptomatic of the change in the competitive dynamic in European football. Some clubs have adapted. Ajax remain true to their identity as an institution that develops then sells gifted young players, while Portuguese clubs make use of the historical links with South America to import and then export players from that continent. Nonetheless, at the highest level European football is a two-tier structure. There has been much focus on Atletico Madrid this season, because they have challenged the Real Madrid and Barcelona duopoly. Nobody expects it to be long-lasting, though, when Spain's two major clubs enjoy such a stark financial advantage. In Germany, there is an ongoing debate about the Bundesliga, given Bayern Munich's unassailable dominance, while only the vast wealth of the oil-rich Gulf states allowed Manchester City and Paris St Germain to break into the elite. Scotland has become detached, with many young players leaving even Premiership clubs in their early teens to move to England. Celtic, and Rangers, have larger fan bases than most English teams, but their revenues are miniscule in comparison. Talk of cross-border competitions and European Super Leagues can seem wistful, and the reaction tends to be dismissive, but without fundamental change, a small group of clubs and nations will continue to hoard all of the money and talent, to the detriment of the rest. Peter Lawwell, the Celtic chief executive, is acutely aware of Celtic's position in the hierarchy, and he will not be a lone voice when he addresses the issue at meetings of the European Club Association, whose executive board he recently joined. Barcelona will feel victimised, not least because many other clubs will have breached the same rules. The Catalan side can offer the best coaching and personal development, but when it signs young players from other counties, it undermines that country's ability to develop as a football nation. There will always be bigger, richer clubs, but competition is dwindling and that needs to be addressed. Transfer rules and financial fair play restrictions will help, but other clubs and national leagues need to find a more conclusive way to join the elite.